Pokémon Go is the latest augmented related game on mobile that has been downloaded by millions of users here in the UK. The app is attracting players of all ages, from young children with their parents to players aged 40 and above. It’s a craze that has managed to get people moving, heading out into the towns and cities in order to catch Pokémon, collect Pokéballs and other items and take over gyms. Some businesses have removed Pokéstops from their premises but rather than fighting the craze there are ways savvy businesses can use it to their advantage. Here are a few ideas to get you started. If you’re lucky enough to have a Pokéstop or a Gym at your business, invite people to play and reward them on social media. Ask your customers to take a photo while playing at your location and post it on your Facebook page or tag you in a Tweet with the image attached. Reward one lucky winner with a prize, discount or something else of value to your customers. Cafes, coffee houses and pubs, hand out your WiFi password to paying customers who are spending time in your premises in order to collect Pokéballs and/or Pokémon. Turn these people into paying customers. If you already provide customers with your WiFi password, provide a 10% discount to Pokémon players instead! They could choose to stand outside and use 4G, but why not tempt them to come in, buy something and benefit from free WiFi? Pokémon Go eats up the battery in a very short space of time. Since release, portable mobile phone charger sales have skyrocketed. Not everyone has these useful devices, so why not offer recharging stations for your customers? Allow them to recharge their phones while enjoying one of your beverages or something to eat. Look out for players tagging your business in their social updates. Players are sharing information on where to catch different Pokemon types in the local area. There are groups set up on Facebook and Twitter. Look for your local groups, join and watch for mentions of your business so you can re-share. You may have some players working for you. Ask them to inform you about any rare or difficult to find Pokémon that may pop up. Share this information with your customers on your social profiles and in the groups along with an image if possible. Tempt them to come and buy from you by offering a limited time offer such as a discount or freebie. Make the offer exclusive for anyone who buys from you and shows they have caught the Pokémon in question at your premises. You could also ask these players to check-in to your business or add reviews on your Facebook page. Encourage players to take photos of their catches with your products in the shot and share on social media. Reward participants with an exclusive discount. Advertise your special Pokémon Go offers on your social media profiles and place signage inside and outside your business to tempt people inside. Make the most of the brand new marketing opportunities and see how this craze could benefit your business. Next PostHow Can I Motivate Content Engagement? 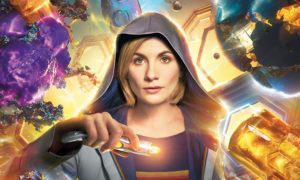 Dr Who is a woman? WTF? Have You Set Up Your Flash Briefing?